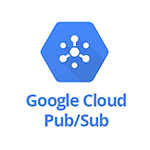 Use SignalFx to monitor Google Cloud Pub/Sub via Google Cloud Platform. Pub/Sub Streaming: Metrics for Pub/Sub if the service is being used for data streaming. Unacknowledged Messages Count - Number of unacknowledged messages aggregated by subscription. Oldest Unacknowledged Message(s) - Age, in seconds, of the oldest unacknowledged message for each subscription. Outstanding Messages Count - Number of messages delivered to a subscription’s push endpoint, but not yet acknowledged. Backlog Size - Total size in bytes of unacknowledged messages aggregated by subscription. Subscription Pull Ack. Requests - Cumulative counts of acknowledge requests aggregated by subscription. Subscription Pull Ack. Message Ops - Cumulative counts of acknowledge message ops aggregated by subscription. 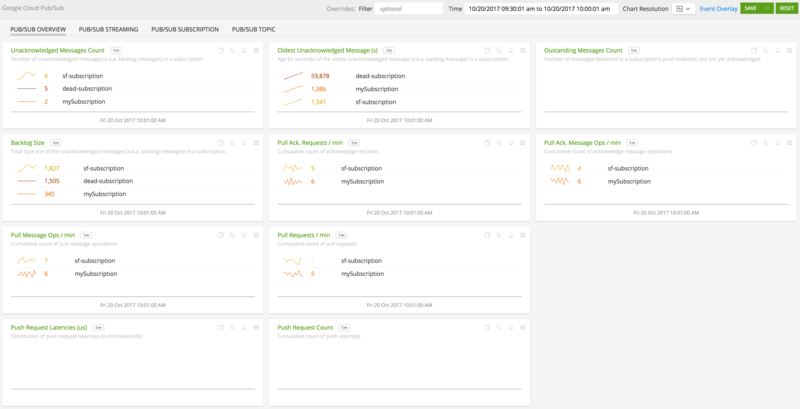 Subscription Pull Message Ops - Cumulative counts of pull message ops aggregated by subscription. Subscription Pull Requests - Cumulative counts of pull requests aggregated by subscription. Backlog Size - Total byte size of the unacknowledged messages in a subscription. Cost per Operation - Cumulative cost of operations per subscription, measured in bytes. This is used to measure utilization for quotas. Undelivered Messages - Number of unacknowledged messages (a.k.a. backlog messages) in a subscription. Outstanding Messages - Number of messages delivered to a subscription’s push endpoint, but not yet acknowledged. Oldest Unacknowledged Message(s) - Age (in seconds) of the oldest unacknowledged message (a.k.a. backlog message) in a subscription. Send Requests - Number of publish requests. Send Message Ops - Number of publish message operations. Bytes per Operation - Cost of operations per topic, measured in bytes. This is used to measure utilization for quotas. Average Message Size - Average of publish message sizes (in bytes). Total byte size of the unacknowledged messages (a.k.a. backlog messages) in a subscription. Cumulative cost of operations per subscription, measured in bytes. This is used to measure utilization for quotas. Cumulative count of configuration changes per subscription, grouped by operation type and result. Cumulative count of ModifyAckDeadline message operations, grouped by result. Cumulative count of ModifyAckDeadline requests, grouped by result. Number of messages delivered to a subscription’s push endpoint, but not yet acknowledged. Number of unacknowledged messages (a.k.a. backlog messages) in a subscription. Age (in seconds) of the oldest unacknowledged message (a.k.a. backlog message) in a subscription. Cumulative count of acknowledge message operations, grouped by result. Cumulative count of acknowledge requests, grouped by result. Cumulative count of pull message operations, grouped by result. Cumulative count of pull requests, grouped by result. Cumulative count of push attempts, grouped by result. Distribution of push request latencies (in microseconds), grouped by result. Cumulative count of StreamingPull acknowledge message operations, grouped by result. Cumulative count of streaming pull requests with non-empty acknowledge ids, grouped by result. Cumulative count of streaming pull message operations, grouped by result. Cumulative count of StreamingPull ModifyAckDeadline operations, grouped by result. Cumulative count of streaming pull requests with non-empty ModifyAckDeadline fields, grouped by result. Cumulative count of streaming pull responses, grouped by result. Cost of operations per topic, measured in bytes. This is used to measure utilization for quotas. Cumulative count of configuration changes per topic, grouped by operation type and result. Distribution of publish message sizes (in bytes). Cumulative count of publish message operations, grouped by result. Cumulative count of publish requests, grouped by result.